This is Jane who booked me for a bridal makeup lesson after having a trial abroad in Croatia where she’s getting married which didn’t go as well as she was expecting. She ended up thinking that she wouldn’t be able to find a professional makeup artist and hairstylist who could create her dream look of being the best version of herself on one of the most important days of their life. As every bride deserves. 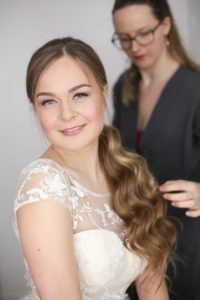 During the lesson she showed me the photos from the trial and I decided to invite her for a makeover with me and Agata to find the bridal look that would suit her best and make her feel the most beautiful ever. As she’s getting married in Croatia we wanted her to have some nice photographs that she could take any future bridal makeup and hair trials should she decide to try her luck again. She kindly allowed me to use the photos that were taken after she had her makeup and hair trial with a local bridal beauty specialist whom she was recommended. The result is the left-hand photo above, the one I’m using as a “before”. I feel strongly about the high level of skill required for bridal styling so that brides always end up looking the most beautiful and flattering versions of themselves – without overpowering and unnecessarily heavy makeup and unflattering hairstyles. There is so much we need to know as makeup artists and hairstylists: which hairstyles to choose for different face shapes, how to disguise taller foreheads rather than emphasise them, how to deal with heavier eyelids and which colours work harmoniously with different skin tones. The list is endless! 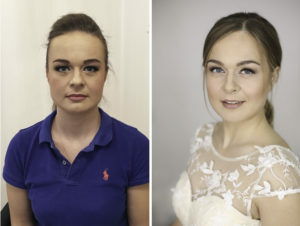 This is why brides-to-be need to research carefully for the best makeup and hair experts for their wedding day so they end up looking and feeling amazing, like never before, and not like someone they’re not with overly heavy and badly executed looks. Since our makeover Jane has had a few more trials with various hairstylists but unfortunately no luck in getting near the beautiful style that Agata created so perfectly. We’re now in talks to fly Agata over to Croatia to create the dream hairstyle for Jane and her bridesmaids. The makeup she’ll do herself – I’m unavailable on her wedding date but taught her how to apply her own bridal makeup beautifully during the lesson. If she adds semi-permanent lash extensions she will look even more amazing. I’m always very proud of the K-Team for being so dedicated and passionate in mastering how to create the most flattering looks for such a variety of face shapes, skin tones and hair types. They do this because each bride deserves to look her best! 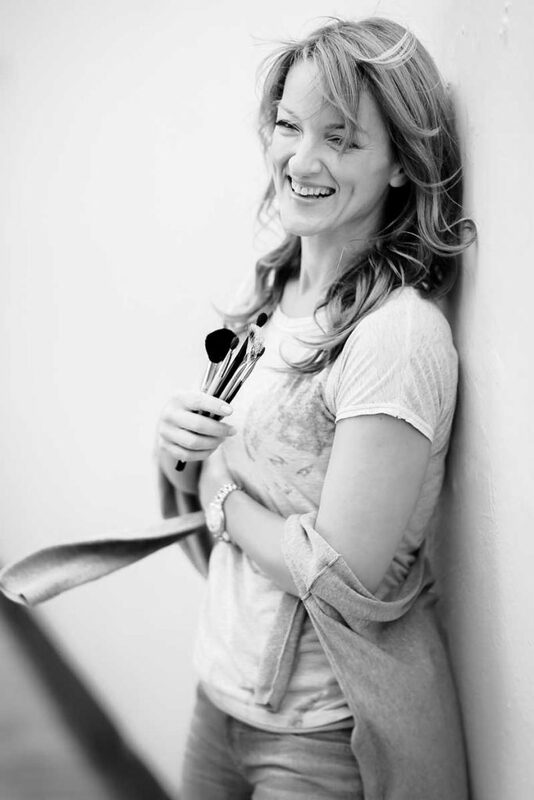 This is also a great example of why I set up the Kristina Gasperas Beauty Academy – to teach and maintain higher standards within the industry so that every bride, every occasion client and everyone who has their makeup and hair done professionally is in awe of the skill and transformations that can be achieved. The power of flawless makeup and hairstyling! As if you were born this way.